Surgery can be a bit scary, but some procedures are following new guidelines that enhance the patient experience and speed recovery time. 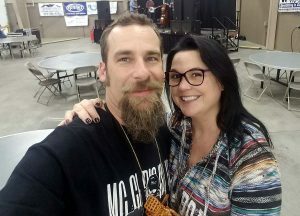 Laura Steakley and her husband. Photo courtesy of Laura Steakley. The prospect of surgery was scary, Laura Steakley admitted. She had delivered her two boys naturally more than 20 years ago, so her looming hysterectomy would be her first time on the operating table. 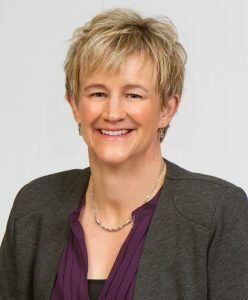 Dr. Amy Johnson, OB/GYN with UCHealth Women’s Care Clinic – Longmont, assured her that didn’t need to be the case. Steakley had the opportunity to be part of UCHealth Longs Peak Hospital’s new program called ERAS, or Enhanced Recovery After Surgery. After learning a bit more, Steakley enthusiastically agreed to participate. “A rapid recovery sounded awesome,” she exclaimed. ERAS follows guidelines that aim to enhance the patient experience and speed recovery time, Johnson said. Patients have less thirst and hunger, which helps their bodies heal faster. Pain management is addressed before and during surgery to decrease the use of narcotics afterward. In most cases, a patient who has had a hysterectomy leaves the hospital the same day, reducing health-care costs. “I get excited when I’m in front of my patients (to discuss ERAS) because it’s amazing that we are able to get them home the same day, off narcotics and back to work so soon,” Johnson said. Steakley had just started working in special education for Weld County School District at Pioneer Ridge Elementary School in Johnstown, Colorado, when a 4-millimeter mass was found between her uterus and fallopian tubes. Although the mass wasn’t life-threatening, it was causing bleeding. So, she talked with Johnson about her options. “A procedure to remove the mass would not have absolutely prevented future bleeding,” Steakley explained. Steakley decided to go through with a partial hysterectomy to make sure she wouldn’t have any recurring problems. Anticipating being ready to return to work in two weeks, she scheduled her surgery for Dec. 19 — over Christmas break. Steakley’s involvement with ERAS started a little more than a week before her surgery. “There is a lot of upfront education,” Johnson said. Steakley first talked with a registered nurse, who reviewed her medical history, medications and detailed instructions for the upcoming surgery. 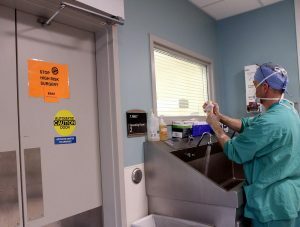 Dr. John Bradley, an anesthesiologist and UCHealth Longs Peak Hospital’s medical quality director, scrubs in for an ERAS surgery at the hospital. Photo by Kati Blocker, UCHealth. Although ERAS has a proven track record for better surgical outcomes since its inception in Europe in 2001, it hasn’t been widely implemented across U.S. health-care systems. ERAS leans heavily on standardization. Surgery involves a lot of different medical specialties, but the ERAS team must include all those specialties, from nurses to anesthesiologists, surgeons to rehabilitation therapists, agreeing in a unified approach. Last year, UCHealth Medical Center of the Rockies in Loveland and UCHealth Poudre Valley Hospital in Fort Collins evaluated ERAS for colorectal surgeries and hysterectomies, and are now incorporating it into those programs. In April 2017, UCHealth University of Colorado Hospital incorporated ERAS into its pancreatic cancer surgery program. So, when the surgical center at Longs Peak Hospital opened in fall 2017, leaders agreed that ERAS should be standard practice from the start. “It’s much easier to start with these protocols than to try to come in and change the way things are done,” Johnson said. The team started with colorectal surgery and then added hysterectomies and total joint replacement surgery. ERAS is now part of the culture at LPH. Steakley arrived at LPH at 7:30 a.m. for her 10 a.m. surgery. She met with a nurse, anesthesia team and surgeon, who discussed that morning’s timeline. With a sip of water, she was given three non-narcotics: acetaminophen, ibuprofen and gabapentin, a nerve-pain medication. “This way, by the time the patient is in surgery, asleep, and we are making that first incision, those medications are already in effect,” Bradley said. 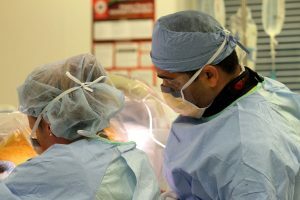 Dr. Sunil Jani, right, a surgeon with UCHealth Orthopedic Clinic – Longmont, works on a patient. Photo by Kati Blocker, UCHealth. During the operation, non-narcotic techniques are used first, such as spinal blocks, lidocaine drips and ketamine. Opioids become a second or third line of treatment, he said. By following these practices, MCR, showed a 50 percent reduction during its six-month pilot program in the amount of narcotics needed for ERAS surgeries when compared to the average use of narcotics for these surgeries prior to ERAS implementation. Patients also have a role in the success of ERAS and are given simple instructions proven to help their recovery. The day before the surgery, Steakley showered with the antibacterial soap she was provided. She wasn’t allowed to put on makeup, perfume or any type of moisturizer. She was advised to purchase acetaminophen and ibuprofen for pain management for when she returned home. On the morning of the surgery, she again showered with the antibacterial soap and steered clear of cosmetics. She was also to drink a carbohydrate drink the night before, and another the morning of, finishing it at least two hours before surgery, which is much different than usual pre-surgical instructions. Hydrating before surgery is not standard. Historically, surgical instructions advise patients to stop eating solid foods at least eight hours before surgery and stay away from drinking liquids for four hours beforehand. 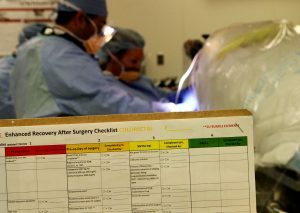 ERAS allows patients to eat until six hours before the surgery and stresses the importance of a carbohydrate drink, such as Gatorade, two hours beforehand. “By preoperative carbohydrate preloading, the body is better prepared to bounce back and recover from this big physiological impact that’s about to happen to it,” Bradley said. Steakley’s surgery went well, and afterward, she was taken to a recovery room, where her pain was again monitored using non-narcotics as a first option. “I woke up really easily, and I had very little pain at all,” Steakley recalled. She was given ice chips initially but then had soda crackers and Jell-O and another carbohydrate drink. Later that day, she was back to her regular diet. This, along with the decreased use of narcotics, helped her digestive system to start working again sooner after surgery. For ERAS to be successful, everyone must agree to do everything the same from start to finish every time. An ERAS checklist helps them do that. Photo by Kati Blocker, UCHealth. Narcotics reduce the function of the body’s bowels, Bradley said. So, besides better pain control with non-narcotics and less exposure to the risk of addiction, patients’ bowel functions return more quickly on non-narcotics. “This is especially true with colorectal surgery,” he said. “We have to wait for those functions to return before they are allowed to leave (the hospital), so that’s why they usually stay so long. But we are finding half of our patients don’t even need narcotics, so we can start giving them juice and other clear liquids sooner. Now, instead of five to seven days (in the hospital), we are seeing patients go home in three days or earlier. LPH has improved outcomes, and patients are spending less time in the hospital. For example, the average length of stay for colorectal surgery patients is now 3.6 days compared to the 5.9 days that UCHealth patients have historically averaged. For LPH hysterectomy patients in the first ERAS year, 88 percent are going home the same day, while 98 percent spend less than two days in the hospital. About four hours after Steakley went into surgery, she was heading home. Steakley took Tramadol — a narcotic, but one considered less potent than hydrocodone — the first night she was home and the next morning, but then continued with acetaminophen and ibuprofen the rest of her recovery. “I wasn’t using any (narcotic) pain medication, and that was even with the holidays,” she said. For two weeks, Steakley had heavy exertion limitations. Otherwise, she could return to normal everyday activity. She had a follow-up doctor visit three weeks later, and again at eight weeks. She returned to school after her break. “I physically have to assist the kids, and I haven’t had any issues,” she said. Bradley said LPH as well as other UCHealth hospitals continue to evaluate where ERAS implementation makes the most sense.